Greece agreed to change some terms in the planned privatisation of natural gas distributor DEPA, opening the way for Russian energy giant Gazprom to bid for the firm, a senior official directly involved in the sale talks said on 25 May. Privatisation agency HRADF finalised the terms of the sale contract late on Friday, lowering the amount that DEPA's buyer will have to deposit as a guarantee before the deal gets regulatory approval. "The guarantee was halved to 10% of the purchase price," the Greek official told Reuters on condition of anonymity. HRADF also said it would compensate the buyer if DEPA fails to collect overdue bills owed by recession-struck Greek clients. "We are guaranteeing up to €180 million of arrears if they are not settled by 31 December 2015," the official said. Gazprom has been lobbying hard to wring these concessions from Athens, leveraging its position as the only major energy company interested in buying DEPA. Cash-strapped Greece needs the DEPA sale to go through to hit the privatisation revenue targets set in its EU/IMF bailout. 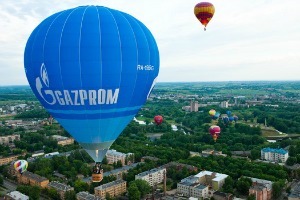 Gazprom last year made a preliminary bid of €900 million for DEPA, whose 2012 net profit stood at €106 million. But the Russian firm's role as DEPA's main supplier has raised concerns that the EU, already trying to loosen Gazprom's grip on Europe's energy market, might block or impose stringent conditions on the deal. Under the final terms of the DEPA sale, Gazprom will not lose any of its deposit if the EU blocks the DEPA acquisition, the official said on Saturday. HRADF also pushed back by about ten days a 29 May deadline for the submission of final bids to give DEPA's suitors more time to study the final sale terms, the official said. Gazprom's only rival for DEPA is M&M Gas, a joint venture by Greek energy firms Motor Oil and Mytilineos. But M&M's initial bid of about €550 million was far below Gazprom's and its parent firms owe money to DEPA and compete with it in the wholesale gas market. Sintez, a small Russian energy firm controlled by Russian tycoon Leonid Lebedev, is expected to submit a binding bid just for grid operator DESFA, which is part of DEPA but can be sold separately. Sintez's major rival for DESFA, a regulated business with a steady profit margin, is Azerbaijan's state gas firm SOCAR. Greek-Czech consortium PPF/Terna may also submit a final bid for DESFA. As cash-strapped Greece is selling many of its state assets, three Russian companies - including Gazprom - bid last year to acquire the Greek gas companies DEPA and DESFA. There were 17 bidders from 12 countries. Greece expects to obtain no less than €2 billion from the auction. DEPA, the public gas supply corporation of Greece, has been estimated at €1 billion in value and DEFSA, a fully owned subsidiary of DEPA, is estimated at €500 million. This can be Greece’s salvation and independence from the grip of the European hawks. All I can hope is that the government will for once act for the true benefit of the country as a whole rather than lining their own pockets.